Meat Industry/AgroProdMash, which takes place annually in Moscow, is the largest exhibition of modern technologies for food processing and food ingredients, and the only exhibition in Russia displaying all stages of the food value chain. 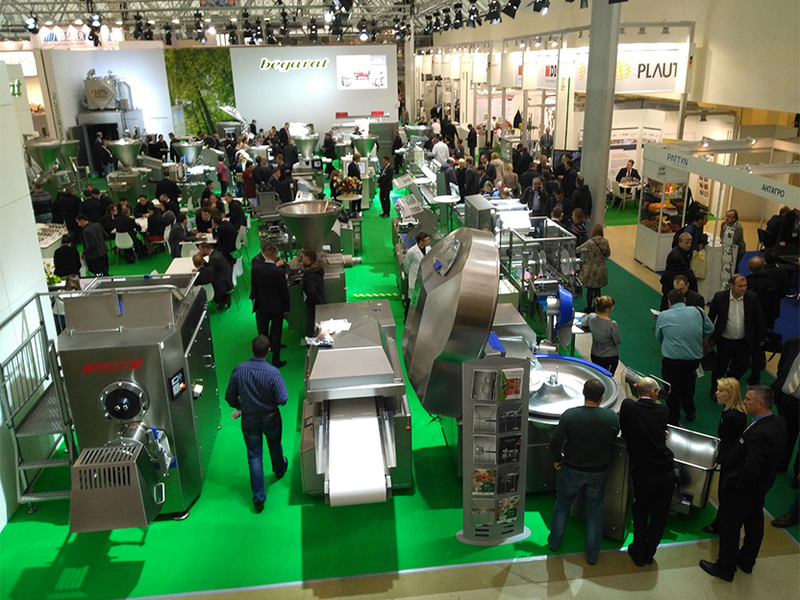 In 2016, more than 732 companies, an increase of 2,6% compared to 2015, from 34 countries presented their latest technologies and solutions for food processing, ingredients, packaging, cooling and storage equipment to over 22,000 international visitors. New this year was the exhibition area “Rybpromresurs” featuring over 50 companies in the field of fish farming and processing. The official German Pavilion supported by the Federal Ministry of Economic Affairs and Energy featured 30 participants on 1,309sqm space in two halls. Furthermore, country pavilions from China and India took part. According to GTAI (Germany Trade and Invest), production of machinery and equipment in Russia increased by 2.8% in the first half of 2016 as compared to the same period in 2015. The sales market also stabilized as the import of German machinery demonstrated only a decrease of 5.2% (2015: -26.8%). The Russian Federation supports the national industries substantially, especially for the construction of meat processing factories, bakeries or greenhouses, with the purpose to develop a competitive food processing industry. The Russian food industry offers great potential for international manufacturers of equipment and machinery for food processing. The next edition of Meat Industry/AgroProdMash will take place from October 9 – 13, 2017 in Moscow. To receive further information about the exhibition and application forms interested companies may contact IFW-expo Heidelberg or visit www.ifw-expo.com.